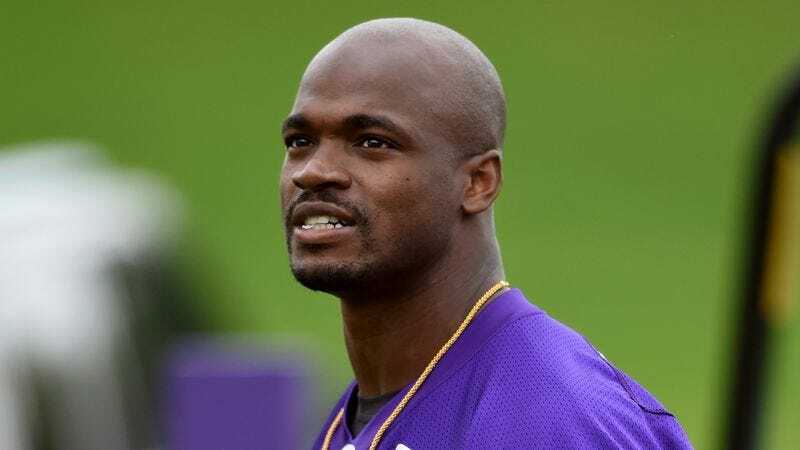 EDEN PRAIRIE, MN—Hoping to gain some insight from his incredible wealth of knowledge and experience, younger Minnesota Vikings players told reporters Friday that they have been picking running back Adrian Peterson’s brain during minicamp for helpful parenting advice. “My 4-year-old has been throwing a ton of tantrums lately, so naturally I sought out Adrian to see how he handles these situations with his own kids,” said wide receiver Adam Thielen, adding that he hoped to get the six-time Pro Bowler’s perspective on how to quickly and effectively discipline his children to prevent their bad behavior from getting out of hand. “Sometimes when I tell her to clear her plate, she’ll just outright ignore me, and getting her ready for bed is always such a struggle every single night. But Adrian is the go-to guy on the team for all this stuff, so I’m sure he has a few tricks up his sleeve. He’s always willing to take the younger guys on the team aside and talk about fatherhood and the responsibilities of raising a family.” At press time, local police officers were responding to a spate of 911 calls relating to domestic violence throughout the Twin Cities area.